Hi all, hope all is well, its been a while since I posted any updates. I've finally completed the first of many children's picture books, you may have seen a copy a while back, but I wasn't happy with the end results from the printers and there has been many, many changes. I have also designed the website in Affinity Designer which contains games and free activities for schools and parents. 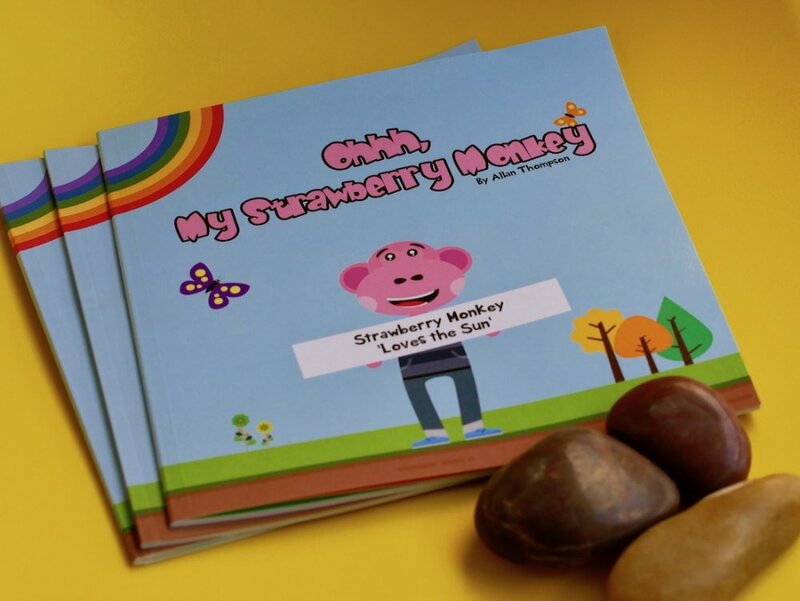 Ohhh My Strawberry Monkey is the series of books and are stories of friendship based around a cute, pink, lovable, but somewhat clumsy monkey who will certainly cause a few chuckles. If you have grandkids, kids, nieces or nephews go check this out! Superb work, Allan! You certainly can't argue with those reviews on Amazon! Nice to see work done in Affinity on real world. Thanks for sharing Allan Great work on the site and book! So... when can we expect the second? Excellent work loon! Glad to see it taking hold and strating to gain traction. Well deserved....! Good luck though. At least it IS heading in the right direction. How you getting on with publishing? Do you have a publisher? Yeah, I'd love to get a 'wee eejits' series out. Plenty o' characters in my sketchbook to work with (I did start something alooong time ago) but I struggle with the stories/format/ideas. I chose not to pursue a publisher, didn't like what I read with their submission guidelines. Plus I'm so much further ahead then I would be with them and I feel penalised by them and some picture book bloggers by choosing to go down this path. It's 2018, we have Instagram, Twitter, Facebook, there is no reason besides the cashflow why anyone needs a publisher. Just some patience, hustle and hard work and all will be good. However, if Ladybird came along then we'll talk...Plus I'll be in a much stronger position if I hit some seriously good sales. Yeah, I feel exactly the same way. If you are able to create a quality product, then why not have all the control and market it & sell it yourself. Of course, it's a lot, lot harder but the rewards are greater, I feel. Been the same way with my card game and if I ever do books, I'll travel the same path as yourself. Inspiring stuff. Keep going loon! Like yourself I too am waiting for Publisher but could not wait any longer and will be publishing a book that has been done on Serif PagePlus X9. Would have liked to be on the AP but can't have everything. Perhaps the next one. Ohhh my, so much in common. Love the mindset. Look at what Affinity, @MattP and the other cool dudes have done, whilst they may have had a head start on Windows with the Serif range, coming over to macOS and iOS is big and they have done an amazing job, taking on the so called big guns (I do love Adobe BTW, Audition, Character Animator is cool) changing up the game and having their rightful success. By the end of 2018 we will have a stable Affinity Designer on iOS and Publisher. It's inspiring, many have gone on to create amazing things against the grain, against the norm, despite the noise and negativity, but its all fuel, its what drives us on. Yep, had to get on with what I had. I'm sure we are really close to seeing Publisher! Ohhh My. Super excited to have my children’s picture book reviewed. All created in Strawberry Monkeys favourite app. Affinity Designer. So happy to see this moving in the right direction! Je n'ai pas d'enfants (désolé pour ce beau livre). Mais le singe rose ressemble à un shamallow et moi! J'aime le shamallow. Well done Allan, there's no stopping you now! Take a deep breath, smile and then bask in that warm glow; that some toddler, somewhere, way-past-bed-time will not go to sleep until that book is read by Gran or Grandad for the third time! Or that poor primary schoolteacher who is getting badgered with "Miss, Miss...when is the next book coming out and will you read it to us when it arrives?" So I'm not putting on the thumb screws at all. In fact it's a massive pat on the back. Move over Peppa Pig...the revolution has started and it is strawberry coloured! Thanks Peter, don't forget instagram! Netmums is coming! Sorry I'm late to the party but congratulations on publishing your own book, that is something that many people dream about doing but for some reason or another they never get around to it. I love the type (or font) on your My Strawberry Monkey logo. Is that your own writing/drawing or is it an actual font? It is great to see what people have made using Affinity's products! Yes, I agree we all have our own little passions, I cut down my hours at work and just studied, read, researched and put in a lot of hard work, along with passion, determination and the desire anyone can achieve their dreams. The font is one I downloaded, can't remember, at some point I may create my own. A great blog post for parents on why it's important to let children make mistakes...FT Strawberry Monkey. I love the type (or font) on your My Strawberry Monkey logo. Is that your own writing/drawing or is it an actual font? That font looks mostly like Baby Kruffy but the 'M' is fatter (perhaps borrowed from Oogie Boogie). Thanks for the info. 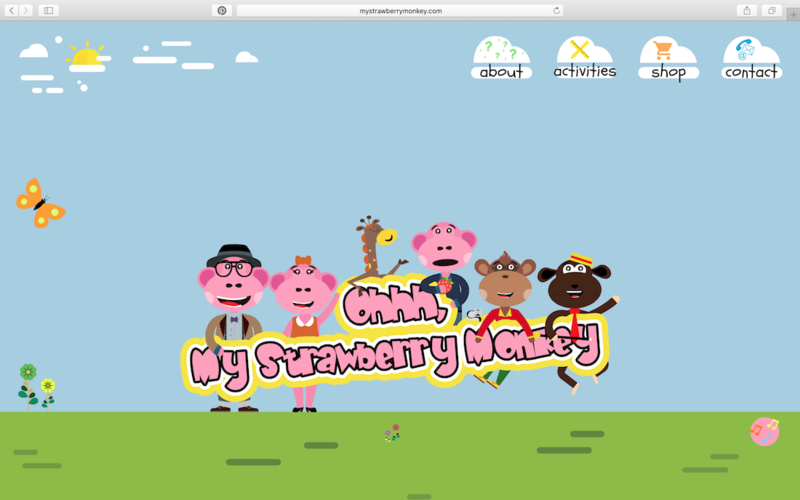 The font fits very nicely for what I imagine when I hear "My Strawberry Monkey" so it was the perfect choice by Allan. If you have kids or grandkids, nieces, nephews go grab a copy here! 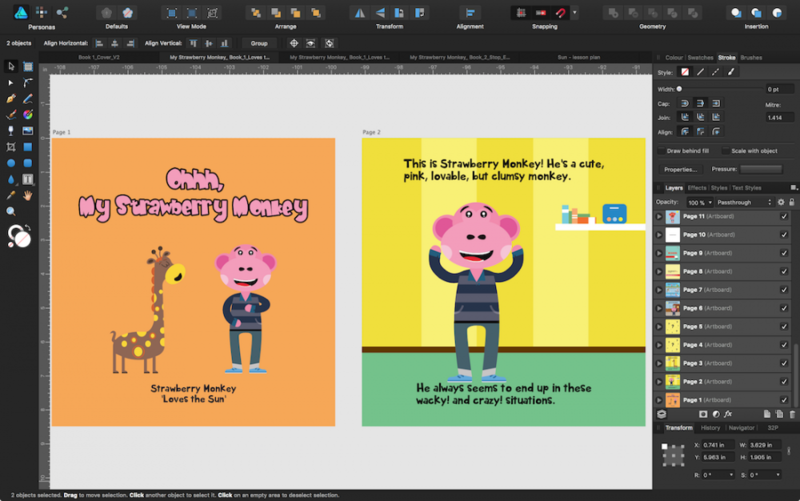 After much work and many changes, the 2nd book in the 'Ohhh My Strawberry Monkey' series is now available on Amazon.